I watched a couple of movies over the weekend, one of which was “Maleficent”. “Maleficent” is a Disney movie and the story is based on the fairytale “Sleeping Beauty”. Remember the story? A baby girl is born. She is Princess Aurora. There’s a big christening party but the evil fairy isn’t invited. Naturally, she’s angry and puts a curse on the princess. This evil fairy is Maleficent. The story is told very differently, offering a different angle to look at what happens, why Maleficent is so angry and who’s really to blame. Surprisingly, I enjoyed this film. To be honest, I was half expecting to fast-forward the last half of the film but that didn’t happen. Anyhow, if you’re interested, check it out. Who knows you may like it. For now, here’s a little quiz for you. I’ll give you three sentences. Please listen carefully and choose the one that is NOT TRUE. Ready? 1. 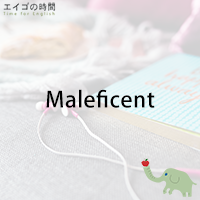 Junko watched “Maleficent” and several other movies over the weekend. 2. Junko didn’t like “Maleficent”. 3. “Maleficent” exceeded Junko’s expectations. Next Post これって何するもの？ – What’s it for?